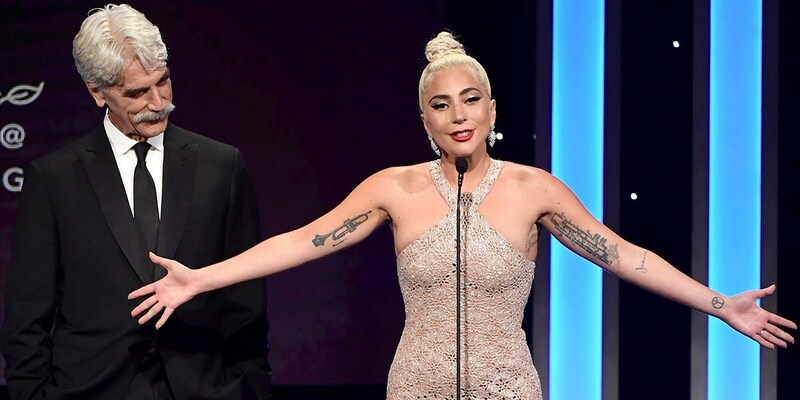 Lady Gaga gave an emotional speech dedicated to her A Star Is Born co-star and director Bradley Cooper, who was 32nd recipient of the American Cinematheque Award at a fundraising ceremony in Beverly Hills. Joined on stage by Sam Ellion, Gaga praised Cooper and told him that she "will never love again a director the way I loved Bradley Cooper," referring to the final A Star Is Born song, "I'll Never Love Again." "When we do these Q&As and things together, sometimes he calls me Gaga, but we both know that you call me Stefani," she told the audience. "I ran from Stefani for a long time and I put on a superhero cap and called myself Lady Gaga. You challenged me to deep dive into a place where I had to see her again, where I had to be Stefani again. I'm so grateful to you, not just for making me a better actress, but I'm so grateful to you that not only have I been able to call you as a professional, but I've been able to call on you as a friend, and cry, and be myself, and have you never ever judged me. It means everything to me. I've never had an artistic experience like this before. And there's only one human being on the planet that you remind me of and that's Tony Bennett." Your Least Favorite Gaga Single?